It’s been nearly 10 years ago that Iwan and Nancy van Es changed the hectic Netherlands for the vast countryside of Southwest France to build a hotel. Their choice fell on the beautiful Landes Chalosse, which is very centrally located in the South of the Landes region, not far from the Atlantic coast and the Pyrenees. The landscape is characterized by green hills that offer beautiful views of the peaks of the Pyrenees. It is this environment that you offers peace and space for your holiday. 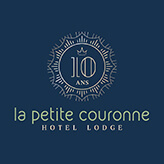 In our small boutique hotel and lodge La Petite Couronne, you will feel at home. This is mainly because of our personal hospitality. With great pleasure we accompany you to your room, where we explain the facilities of our hotel and restaurant and are happy to provide a detailed explanation of the possibilities in our environment. Our service is totally focused on you! It is precisely because of this personal hospitality that we have already received many English speaken travellers. But of course also by the modern touch, the comfortable rooms, our gastronomic restaurant, our Dutchtub (spa), the free Wi-Fi, space and peace. We invite you to come and discover this quickly!